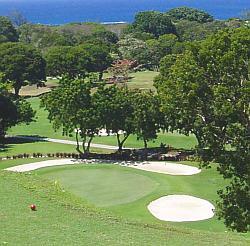 Barbados Golf - Barbados is the golfer's paradise! Fodor's travel guide says of Barbados... "Golfers can choose from among some of the best championship courses in the Caribbean". Indeed, the sunny weather all year round makes Barbados an ideal location for golf and the perfect vacation spot for golfers and "would-be" golfers! The glorious weather conditions are complemented by world-class golf courses and facilities. Most local golf clubs offer professional instruction. Several golf tournaments are hosted throughout the year, attracting participants from a number of countries including Europe and North America. In December 2006 Barbados hosted the World Golf Championships World Cup. The four-day tournament was held at the Sandy Lane Country Club course on the west coast of the island. 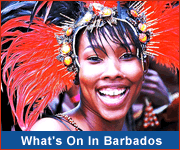 In October 2004, perhaps the world's most famous golfer - Tiger Woods - chose Barbados as the venue for his wedding. The ceremony took place at the Sandy Lane Golf Course. Enjoy a round or two on our 6,805 yard course featuring a dramatic 'Amen Corner' on holes 15 & 16! 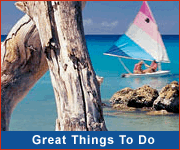 Excellent golf vacation packages are available from official partner hotels.